Heya! 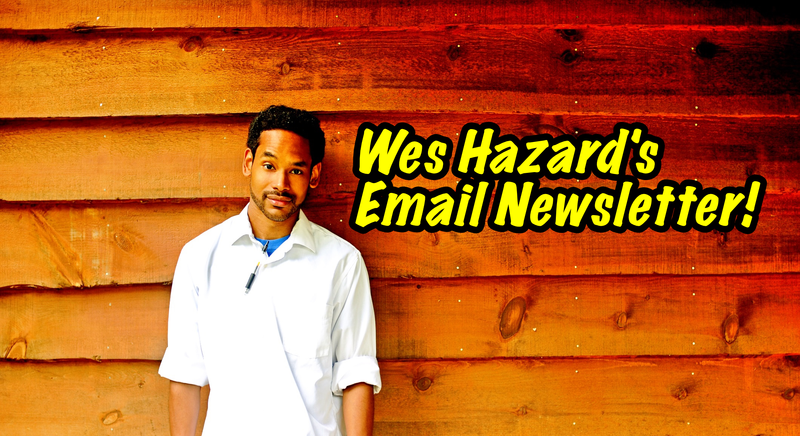 I'm Wes Hazard a standup comic, storyteller, writer, and TV host. Thanks for being interested in my email newsletter. I'm happy to tell you a bit about what you're signing up for and why I think you should. First, if you've seen me perform or come into contact with any of my writing or artwork and you liked it then this is the absolute best way to stay on top of upcoming appearances and projects. I keep readers of this newsletter updated on cool shows, big news, and cool career stuff that I'm really excited about. Secondly, I try to read/watch/listen to/experience as many cool things as I possibly can, and I ALWAYS have an opinion about them. With each newsletter I round up the most interesting or hilarious or thought-provoking, (or awful) stuff I've come across since the previous issue and share it with you along with some thoughts and links. It's like that 9 year old email thread you have going with your high school friends where you share your fav youtube links, memes, and book recs but different...and more random...and with a dash of social justice content. It's all fun and I will never spam you and you can unsubscribe at any time so give it a try, you'll like it!